Sit, Stay, Get the Ball! Min Pins can do it all! If your looking for a breed of dog that can excel in many areas the Min Pin has proved time and time again that anything from basic obedience to agility to sporting events such as tracking or fly-ball is well within his abilities. 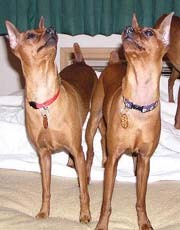 Min Pins thrive on attention, bonding and pleasing you, giving him a job to accomplish satisfies many of his needs. From running and jumping to putting a smile on your face Min Pins can steal the show at any given time in any circumstance. Kryket & Kissy: Owned by Laurie S.
Once your puppy has received all of his proper vaccinations and can safely be taken out and socialized with other people and dogs a Puppy Kindergarten class is a wonderful first step to preparing your min pin for not only fun activities such as agility or obedience competition but this also helps in raising a polite and well socialized dog that will be a joy to take any where. Puppy Kindergarten generally requires the puppies to be between the ages of 12-18 weeks with the courses gearing more towards proper handling, training, correcting, rearing and socialization of puppies to avoid behavioral issues that can come up as your puppy grows. Because puppies develop rapidly during this time their temperament must be formed carefully to avoid having a nervous puppy that can be out of control or become a nuisance to others. Good behavioral patterns established now will create a much more enjoyable puppy that will be a happy member of your family. A puppy kindergarten class, as well as teaching the puppy, teaches you the proper way to communicate with your puppy and how to correct bad behavior in a way that will encourage your puppy to continue on his path to obedience. Puppies are started out with basic commands, Sit, Down, Stand and Come in a way that this age group can understand. Because socialization is the main goal with puppy kindergarten, between learning the basics; spending a lot of time playing with other people and puppies is a big part of the class. In addition to learning the first steps of basic obedience other training areas are touched upon as you and your pup are introduced to agility and other sports that you may want to learn more about. Basic Obedience is your next step, as your young puppy becomes a teenager. Puppy Kindergarten introduced your min pin to basic obedience, now it’s time to get to work. Changes in your puppy will become apparent as he grows for a dogs behavior is constantly changing. A dog that is well behaved today may not remain that way. New problems can come up and existing problems can get worse. Proper training keeps the lines of communication between you and your min pin open and many times a properly trained dog has been saved from life threatening situations. Min Pins excel in obedience when it is done properly, those bouncing bundles of energy can do a long sit, stay and enjoy doing it when they see that this pleases you. Min Pins are known for being able to dart out an open door, quickly escape from a gate or think that anyone that visits your house is there to see him and they should expect to be jumped on and have their faces licked. A properly trained Min Pin can be stopped with a voice command or sit patiently while your guest visits, thus not only keeping him safe but creating a pet that is a joy to be around. AKC Obedience competition - You will probably find that your training classes were a wonderful bonding experience for you and your Min Pin. Just because the classes have come to an end, the special closeness does not. There are many competitions and sports you can go on with using all the techniques you have learned in your classes. You may not have a Min Pin that was destined to set the show ring on fire but there are many AKC events that you can compete in. You can work your way through the titles of AKC obedience competition by first earning your CD (Companion Dog) title, this is the Novice level. To earn this title you must show that your Min Pin can demonstrate skills that make him the wonderful companion that he is. Your Min Pin is required to heel both on and off leash at different speeds, come when called, stay with a group of dog and stand for a physical exam. Once your Novice level has been successfully completed and your Min Pin proudly displays the title of CD after his name you can move on to the Open Trial for obtaining your CDX (Companion Dog Excellence) title. He must demonstrate the same abilities that he proudly proved he could do when obtaining his CD but for longer periods of time and now some jumping and retrieving skills are needed. Now that you and your Min Pin as a team has earned his CDX title you are probably hooked and want to keep going. The next step is the Utility level with your goal being the title UD (Utility Dog) To earn this your Min Pin must show his ability to follow hand signal exercises and scent discrimination, you must earn three qualifying scores to obtain the title UD. By adding ten additional Utility legs the two of you will be honored with the title of UDX (Utility Dog Excellence). I want to send a THANK YOU to Kathy Duncan for her help with Obedience information. AKC Agility - Maybe the roar of a crowd and the fast pace excitement of an obstacle course is what you and your Min Pin are looking for. If that is the case, you can satisfy that need for speed in Agility competition. During your obedience training you learned that you and your Min Pin must work as a team and this skill is put to the test when you step out onto the Agility course, the timer is ticking and your Min Pin is looking at you for your directions as he clears the course in animated delight. Agility became an official AKC competition in 1994 and has since grown in population at the speed of light. The agility course is set up with a variety of obstacles consisting of hoops to jump through, poles to weave in and out of, tables to down-stay on, teeter-totters to maneuver, while throwing in some jumping obstacles. You and your Min Pin as a team will start earning your NA (Novice Agility) and progress through the titles as the courses become more and more challenging. As with Obedience competition each successful step earns you a new title ranging from your start in earning the NA to OA (Open Agility), AX (Agility Excellence), MX (Master Agility Excellence). AKC competition requires your Min Pin to have his AKC registration papers. If you do not have AKC papers for your Miniature Pinscher, especially in the case of an adopted Min Pin from a rescue group or individual you can apply for an ILP (Indefinite Listing Privilege) number. Dogs with an ILP number are eligible to compete in Obedience trials, Tracking test, Herding, Lure coursing, Agility, Earth dog events and Hunting test. An ILP is not the same as an AKC registration and cannot be used as a substitute to an AKC registration. You will also be required to explain why your Min Pin cannot be registered with the AKC as well as explain why the dog is considered an AKC recognized breed. Flyball – For the ultimate rush in canine excitement, for extreme need for adrenalin pumping action, for those Min Pins that don’t know the meaning of “Slow down” there is Flyball. To give you a better idea of what a Flyball arena looks and sounds like, picture this: A starting light that looks like it belongs on a drag racing track, a starting line, a course that is a straight line, 51 feet long, four hurdles spaced ten feet apart, a spring loaded box 15 feet from the last hurdle that spits out tennis balls, two teams consisting for four extremely excited, ready to get on with the show barking dogs of all colors, sizes and breeds. There are many more dogs with their handlers, barking with excitement while waiting their turn to “fly”. This is the world of Flyball. Now we are all set up for a relay race like nothing that has ever been seen before. The owners hold on to their dog as they watch the starting light to signal the race can begin. Side by side on two courses the first of the four team mates are released to clear the four hurdles, activate the spring box at the end of the course to retrieve a tennis ball which they must hold on to as they turn around and quickly repeat the course and end up back in the arms of their owner. While the race is on the second dog in the team of four is ready to cross the starting line as his team mate returns. This continues until all four dogs of both teams have run the course; the winning team is the team that finishes first or has the least amount of errors. Flyball teams Love to have a small breed of dog on their team. 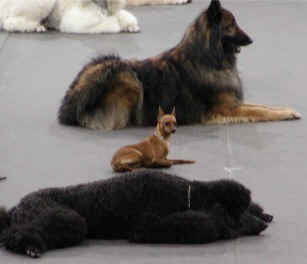 The height of the hurdles is based on the size of the smallest dog on the team. Flyball is not an AKC event, but titles are still earned as you make your way through competitions. Not only is this a team sport, your dog earns points for himself that reflects the overall success of his teammates. The dogs earn points towards flyball titles based on the teams time. Once your dog has earned 20 points he has earned the title of FD (Flyball Dog). Titles increase as the points increase until the ultimate honor of the FGDCh (Flyball Grand Champion) title is reached after receiving 3000 points.